Where: 20 Fenchurch Street, EC3M 8AF. Nearest station: Monument. Opening hours: Monday 7am – 11pm, Tuesday 7am – 12am, Wednesday to Friday 7am – 1am, Saturday 8am – 1am and Sunday 8am – 11pm. The viewing atrium is open to the public Monday – Friday 10am – 6pm and 11am – 9pm on the weekends. It’s time to get out and explore our beautiful city. 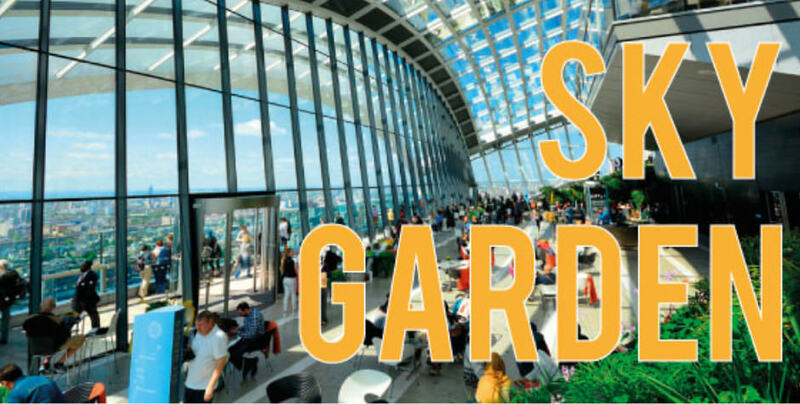 If you enjoy great views we recommend that you visit London’s Sky Garden. Panoramic views of the London skyline await you on the 43rdFloor of the Walkie Talkie. You’ll find this hidden gem at 20 Fenchurch Street, EC3M 8AF, only a short walk from Monument Station. The dazzling floor-to-ceiling glass windows offer an exhilarating panoramic view of our great capital. See The Shard, The Gherkin, the ‘Cheesegrater’, Tower Bridge and, of course, the River Thames. It’s all there for you to enjoy. Not only can you enjoy the brilliant London scenery, there is also a wonderful indoor garden to be admired. Filled with a wide variety of dense greenery, the indoor garden offers a serenity which perfectly complements the striking vista of the London skyline. Dining at London’s Sky Garden is truly special. The venue offers a variety of eateries. Try Darwin Brasserie and Fenchurch Restaurant for classy British fare, City Garden Bar for a tempting selection of cocktails, or head to Sky Pod Bar for a coffee and cake. To visit London’s Sky Garden, you will need to book no fewer than three days in advance. The best times will be around sunset; however, any time of day will offer beautiful views of London.